As Christina and Stephen prepared for their wedding, which was held in Kington, Herefordshire in June 2011, Christina chose a handmade Swarovski tiara, earrings and necklace from the Aristocrat Tiaras bridal collection. The couple also commissioned Aristocrat Tiaras to make the bespoke decorations for their wedding cake. The cake, which was baked by a friend, Jill Williams, was iced in white royal icing with the top two layers made from 6 inch and 8 inch diameter sponge and a lower layer made up of a 10 inch fruit cake. There were 4 individual decorations which were designed to cascade down the wedding cake giving extra glamour and sparkle. Each decoration had a flower created from 38mm clear or lilac crystal glass beads with other parts made up from Swarovski crystal and Matsuno Japanese glass seed beads on a silver plated wire frame. The cake was topped with one clear and one lilac flower, representing the bride and groom. 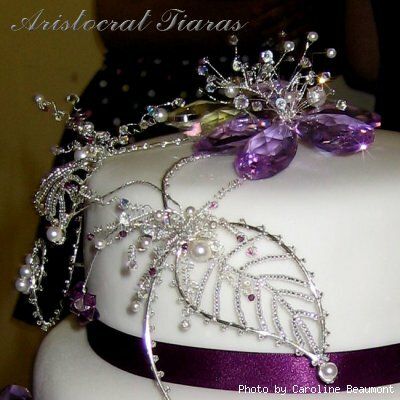 Please contact Aristocrat Tiaras if you are interested in bespoke cake decorations.